This tour will give us a glimpse into the past. The Bidayuh tribe used bamboo exclusively in their daily life. Experience how the Bidayuh survive in the rainforest that kept a thousand secrets. Traditionally bamboo has been used in Ayurveda and Chinese acupuncture. Bamboo is integrally involved in culture and arts. It is a mystical plant that symbolizes strength, flexibility, tenacity, endurance and compromise. Bamboo has for centuries been integral to religion ceremonies, arts, music, and daily life. Bamboo and its related industries provide income, food and housing to over 2.2 billion people worldwide. Bamboo is strong building material. Its tensile strength is 28.000 per square inch versus 23.000 for steel. Bamboo has over 1,000 species on earth. Adaptable to many environments. Bamboo is a high-yield renewable resource. Raw material for house construction. Bamboo anti-erosion properties created an effective watershed, stitching the soil together along fragile river banks, deforested areas and in place prone to mud slides. The sun of stem flow rate and canopy intercept of bamboo is 25% mean that bamboo greatly reduces surface run-off, preventing massive soil erosion. Bamboo shoots provide nutrition for millions of people worldwide. Taiwan alone consumes 80.000 tons of bamboo shoots annually, constituting a US $ 50 million industry. Why wait, come and experienced it yourself. Camping Survival in rainforest. It’s not about the END OF THE WORLD – It’s not about surviving a hypothetical PLANE CRASH – It’s about the SATISFACTION YOU GET knowing you can take care of yourself and/or your family in ANY SITUATION, ANYTIME, ANYWHERE! But don’t make the mistake of thinking that being in a survival situation would be fun. Wilderness Survival is not a game, there are no reward challenges, and there is no immunity. How do you think you would fare in a survival situation? Could you build a shelter? Could you light a fire without matches? Could you forage for food and purify water? In real life you don’t have luxury items, you don’t get tarps and matches and camping supplies. In real life you may not have any tools except your own two hands. If you were stranded in the wilderness would you end up a survivor? The natives and animals of a region have adapted to their environment. To get a feel of the area, watch how the people go about their daily routine. When and what do they eat? When, where, and how do they get their food? When and where do they go for water? What time do they usually go to bed and get up? These actions are important to you when you are trying to avoid capture. Keep in mind that the reaction of animals can reveal your presence to the enemy. If in a friendly area, one way you can gain rapport with the natives is to show interest in their tools and how they get food and water. By studying the people, you learn to respect them, you often make valuable friends, and, most important, you learn how to adapt to their environment and increase your chances of survival. Most people think of the tropics as a huge and forbidding tropical rain forest through which every step taken must be hacked out, and where every inch of the way is crawling with danger. Actually, over half of the land in the tropics is cultivated in some way. Knowledge of field skills, the ability to improvise, and the application of the principles of survival will increase the prospects of survival. Do not be afraid of being alone in the jungle; fear will lead to panic. Panic will lead to exhaustion and decrease your chance of survival. 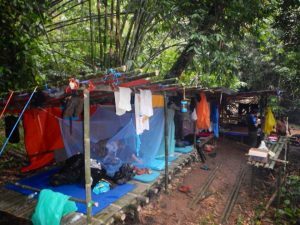 Everything in the jungle thrives, including disease germs and parasites that breed at an alarming rate. Nature will provide water, food, and plenty of materials to build shelters. Indigenous peoples have lived for millennia by hunting and gathering. However, it will take an outsider some time to get used to the conditions and the nonstop activity of tropical survival. The Begu Caves are located about 50 km away from Kuching. Before reaching the destination, you’ll pass by fascinating villages, rubber estates, pepper gardens, cocoa plantations and lush rainforest. Once in the cave, you’ll marvel at the wonderful limestone formations in these mystical caverns that are thousands of years old. Some of the rock formations resemble figures and animals, becoming a point of religious interest for some of the locals. Another attraction in this cave is a cool stream that flows out from it. The major features of the cave include the stalagmites and stalactites, and pillars which form when these two join together. These are all common calcite formations. The minor features include floor cavities, pendants and current scallops. The limestone of the cave is pale grey or blue in colour and is fine-grained. Deposits of clay as well as thin layers of guano or rock phosphate are found throughout the cave. The floor of the main passage has conical cavities which are separated by blade-like pinnacles of limestone. Stream erosion is evident by the smooth horizontal grooves in the floor and scalloped walls of the passages. These current scallops have a honeycomb appearance and indicate the direction of the flow of water. Another formation are the pendants which are limestone projections approximately 60 cm in length and which hang from the roof of the cave passage. The mountain over the cave is covered by limestone forest, which is characterized by thin irregular soil cover and stunted plant growth on the summit. On the slopes and at the base of the mountain is a remnant forest of medium sized trees and shrubs, including such species as Excoearia borneensis (Euphorbiaceae) and Popowia pisocarpa (Annonaceae) and Eugenia sp. (Myrtaceae), Palaquium spp. (Sapotaceae) and Firmiana malayana (Sterculiaceae). To the south and east of the mountain, there is a cocoa plantation extending almost to the base of the hill. There are three groups of cave animals: the troglobites, which are restricted to the cave; the troglophiles, which live within the cave but can also exist in outside environments; and the trogloxenes, which use the cave for roosting but feed outside the cave. Inside the cave, gastropods (molluscs) have been found on the walls and floor of the stream passage. These snails are unique to each limestone area. On the limestone mountain, 12 different species have been found, which include Opisthoporus rostellatus, Brotia costula and Gastroptychia adversa. A variety of birds can be found along the river and on the limestone hill. Several types of bats inhabit the cave and can be seen hanging from the cave ceiling. The black nest swiftlets Aerodramus maximus) can be seen and heard in the cave. they’re accompanied by an adult. Some fishing activities are ideally suited for special interest groups and can be booked for exclusive use at certain times of the year. All we ask is that you take care of our river and all it’s contain during your camping and fishing, consider your fellow guests and those who live in the neighborhood. Sarawak is one of the world’s densest and wildest rainforests. This is an extreme adventure tour, not one for visitors seeking conventional comfort. We currently offer both 4 and 7-day tours To guarantee exclusivity, tour frequency is carefully limited and your group’s maximum size is six, ensuring quality interaction with your tribe hosts and maximal freedom to customize your tour. Dates are flexible but depend on first come basis. 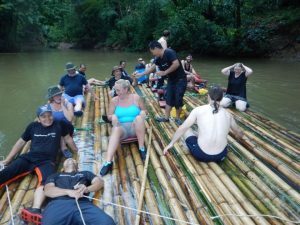 There are gentle rainforest walks, half-day and full-day jungle hikes and some tougher options such as week long camping trips, combined trekking and river expeditions and demanding mountain climbs. The clothing and equipment required for jungle trekking varies depending on the type and length of the trek. However a few things are always worth considering. For a start it is best to wear light clothes (loosely fitting cotton trousers and long sleeved shirts to protect from the sun and scratches) and comfortable walking shoes or hiking boots. Other items worth bringing along are a small rucksack, sunglasses, insect repellent, sun hat, camera and binoculars. Always take drinking water. The Bidayuh race, accounting for 8.4% of Sarawak’s population live mainly within the catchments of the Sarawak and Sadong rivers. Early European travelers gave them the name “Land Dayaks” because they lived in the steep limestone mountains, near the watershed area of West Sarawak, in what was then Dutch Borneo. Many Borneo natives live in longhouses, in effect, a row of dwellings and a village street under one roof. The Bidayuhs, a group comprising the Jagoi, Biatah, Bukar-Sadong, Selakau and Lara peoples of West Sarawak, built their houses in mountain fastnesses, tacked to a steep hillside like a gigantic staircase. This was partly for protection against marauding enemies, partly for access to pure, fresh water. Nowadays, unspoilt culture was still intact within this modernize world. The orang utans (or orang utangs) are one of two endangered species of great apes (the other being the gorilla). Known for their intelligence, they live in trees and are the largest living arboreal animal. They have longer arms than other great apes, and their hair is typically reddish-brown, instead of the brown or black hair typical of other great apes. Native to Indonesia and Malaysia, they are currently found only in rainforests on the islands of Borneo and Sumatra, though fossils have been found in Java, the Thai-Malay Peninsula, Vietnam and China. There are only two surviving species in the genus Pongo: the Bornean Pongo pygmaeus and the critically endangered Sumatran Pongo abelii. The subfamily Ponginae includes the extinct genera Gigantopithecus and Sivapithecus. Following a headhunting trip, the freshly taken heads were skinned, placed in rattan net and smoked over a fire, or sometimes boiled. The skulls were then hung from the rafters of the longhouse and they possessed the most powerful form of magic. The skulls were considered trophies of manhood symbols of bravery and they testified to the unity of a longhouse. The longhouse had to hold festivals called “Mukah” to appease the spirits of the skulls. Once placated, the heads were believed to bring great blessing-they could ward off evil spirits, save villages from epidemics, produce rain and increase the yield of rice harvests. Borneo is blessed with a rich variety of traditional food created by its many tribes and indigenous groups. They are able to turn wild plants, herbs and fruits into culinary masterpieces that will tantalize your senses. Rice is a staple but in the far north, corn and tapioca are popular. Learn and acts like native in collecting food from the forest and learned how to prepare it’s for your meals. This is a dish from the tribes of Sarawak. Pieces of chicken are stuffed into a bamboo tube together with mushrooms, lemongrass and tapioca leaves. It is then cooked over an open fire, the bamboo preserving the taste and fragrance of the ingredients within. The magnificent birdlife of Borneo, the world’s third largest island, parallels that of the bountiful Malay Peninsula, but includes numerous species that do not occur there – among them thirty or more endemics. We begin our tour of this remarkable island amongst the oldest rainforests on earth. Its maze of trails will lead us to a huge range of birds and, hopefully, the first of Borneo’s endemics. Among the major attractions of the rainforest area are a number of elusive but sought-after avian gems such as the glistening-green Whitehead’s Broadbill and striking Whitehead’s Trogon, Black-breasted Fruit-hunter and the shy Crimson-headed Partridge. Also to be seen here are more than 700 species of orchid and 600 different ferns – many of them found nowhere else on earth. Perhaps most intriguing amongst the plants are the Nepenthes pitcher plants, with their intricate traps for insects, eight species of which are found within this amazing rainforest. (răflē´zh ), any of a genus (Rafflesia) of parasitic plants native to the rain forests of the Borneo, The plants have no roots, stems, or leaves, consisting of threadlike growths on the tissues of the vine that hosts them. They produce large buds that may take 9 months to open into huge five-petaled flowers, which in the largest species (Rafflesia arnoldii) measure a yard (1 m) or so across. The flowers of most species have the distinctive odor of rotting flesh. All species are endangered or threatened. Rafflesia species are classified in the division Magnoliophyta, class Magnoliopsida, order Rafflesiales, family Rafflesiaceae. The Rafflesia flower is a parasitic plant that grows on the lower slopes of mountain ranges. It has a limited distribution and is only found in certain areas of Southeast Asia. The first Europeans to discover the Rafflesia were Sir Stamford Raffles and Dr Joseph Arnold in 1816, near the town of Bencoolen (Bengkulu) in Sumatra. Not surprisingly, that particular species was named Rafflesia Arnoldii. The Rafflesia has no specific flowering season. It has no roots, stem or leaves and starts life as a small, dark brown bud attached to its host, the stem or root of a jungle vine. After taking approximately nine months to mature into a cabbage-sized bud, the plant opens. The petals, usually five, sometimes six, are red in colour and covered with lighter coloured spots. When in full bloom the flower emits a foul odour which attracts flies and other insects. The Rafflesia only flowers for 5 to 6 days, before the petals blacken and the flower withers. The flowers are either male or female. Pollen is most likely transferred from one plant to another by flies, whilst scientists believe that the small mammals that eat the fruit of the plant transfer the seeds (via their droppings, claws and facial hair) to other host sites around the forest floor. Although the Rafflesia can grow up to one meter in diameter, the flowers found are usually half that size with the occasional monster-sized plant appearing from time to time. 70mins drive into the remoteness. 40mins trek to the starting point. Arrive at raft starting point by mid-morning. Total land-travel time of 2½hrs against 7-hour tour duration. Total trekking time of less than 1hr. Option to drive there instead of trek. Take only maximum of 8 participants at any one time. Should the group exceeds 12 participants, we will segregate it into 2 groups. Peraya Homestay reserves all the rights to this product through an MOU with Peraya Village Development Committee. We sell direct to our Overseas Principal Agent (OPA). Public e-booking on-line shall buy it at published price.